You roll down the windows and wear a helmet when you take your car to the track. This does not make me less terrified of a fiery death. The American Autocross champion was sitting in my passenger seat screaming at me to not let my foot off the pedal until I bounced off the RPM limiter. She was properly intense. I didn’t know what I was doing, but it’s fun to power through curves in a high-speed tenuously-controlled skid in my Mini Cooper S (plus Cooperworks). 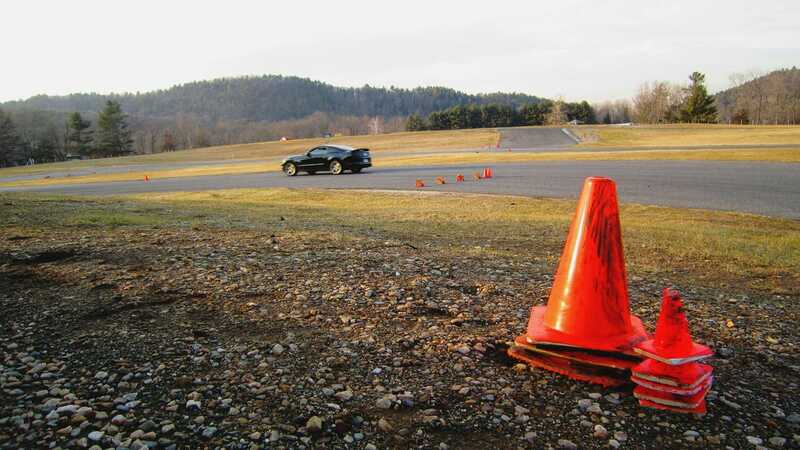 The proper driving strategy for Autocross is bizarre. It is possibly the worst-case scenario for wear and tear on a car. The strategy solves for the spaghetti-like pattern of the track, which is composed mostly of turns and banks, so that the winner is the one who can best negotiate a complex path, rather than which car is fastest on a straight-away. Driving strategy hinges on this constraint: a car can accelerate quickest when it is not turning. “Accelerate” means getting faster or getting slower. Mashing the accelerator pedal or brake pedal while turning, results in a spin-out. So, you do this strange thing where you aim the car at a particular point near the first section of the turn and accelerate as much as possible in a straight line, as if you’re going to fly off the course. As you near that point, you break with just as much vigor. Still without turning the wheel. Then you turn and (more slowly) accelerate at just the right pace such that you’re gently skidding, but still in control. Until you can see the next point on the next turn that you full-accelerate straight towards. What point should you pick? That depends on the curve, but drivers will find what they believe to be optimal points, and will often put small orange cones there as visual guide, especially during practice runs. While this results in a unnatural, jerky, discontinuous motion, it is also the fastest way through the course. Companies in the scaling phase feel like this too. In most ways you are moving faster than ever, particularly when you’re moving in a straight line. For example, a new incremental product will launch to your existing customer base, with immediate impact in the millions of dollars — something a small company will take years to accumulate. But in other ways it is jerky, unnatural course-corrections. Teams reform with new people and new missions. Things that worked for seven years suddenly don’t work, and “tiger teams” assemble to fix it, while new people wonder why it was ever built this way in the first place and older people laugh knowing that in two years, future-new people will be saying the same thing about what the now-new people are building. It is certainly difficult to jerk around. Some people can’t take the forces, and that’s understandable. No one said this would be easy. But it’s also the fastest way around the track. And, while difficult, there’s no feeling like it.